The Amazon Kindle was built for one, fairly specific purpose. For the reading of ebooks. So it might come as something of a surprise that I’ve been using this for a somewhat different purpose. 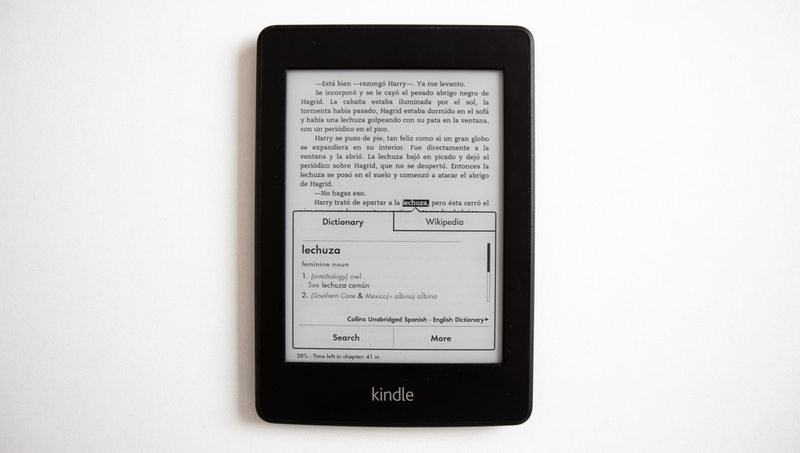 Like many who grew up in the 90’s I am intimately familiar with the Harry Potter series of books and recently I have been using it as a cultural touchstone, attempting to read those oh-so-familiar books in Spanish on my kindle. The kindle’s nifty ability to install a Spanish dictionary means that I’m able to translate words as I go along. Ideal for arming me with the vocabulary I need for debates about whether Snape really was a bad guy with Potter fans across the globe, I believe it has also given me a more authentic understanding of the language, compared to what I might have gotten in an academic setting. This isn’t the first time that we’ve seen products repurposed like this. In fact, the different ways that a technology can be hacked and repurposed is often the thing that gets us the most excited about new developments. When the X-Box Kinect came onto the market, it was seen as just another motion control peripheral in a market that was being flooded with them in the wake of the Nintendo Wii’s success. A few years down the line, all of that changed. Because the Kinect was designed to be compatible with the Windows OS, the surprisingly intelligent 3D imaging cameras were suddenly being used in dozens of new inventions, ranging from accessibility modifications to existing products to guidance upgrades for robotics projects. The Kinect had limited usability in its original role, but the underlying technology had hundreds of applications. In much the same way, the new X-Box accessibility controller is starting to garner a lot of interest, not only because it is going to help so many people with disabilities start playing more video games, but because of the ways that the many different individual components will be usable in other designs. Windows 10 has also recently introduced eye tracking integration; both for accessibility and for the gaming market, designing the software support for hardware innovations further down the line. To people in the gaming industry this seems like the prelude to a Microsoft branded VR headset, but the possibilities of the technology are much further reaching. It isn’t difficult to foresee a future where files are browsed at a glance rather than a click. Then you come to products like Voice assistants, which are designed with the possibilities of future technology in mind. A digital assistant like Alexa could serve as an AI hub, and the user interface, for a whole host of future products and innovations throughout the household and workplace. Innovation doesn’t just stop when a product has been released, and increasingly we are seeing hacks, mods and other processes of remaking applied to every technology on the market; so much so that new products are being designed with this second wave of innovation in mind.